It's the day you have the hotel booked. I've just checked my confirmation and you get e-tickets sent to cover both. The best bit about legoland is the hotel. Not sure if it's much better now, but I went 6 years ago and it was very poor in the park. 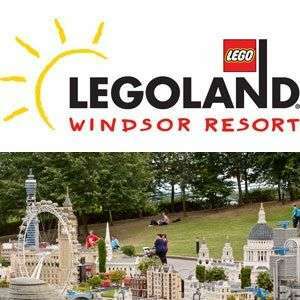 Nearest airport is Heathrow (20 mins to Legoland). Gatwick or Southampton about an hour away. Luton and Stansted about 1.5hrs away. I live closer to Legoland than this hotel. I don't live near Legoland. THIS! We went in September last year for 2 days, stayed at the Hotel and had a brilliant time. Walked on everything. It's all about timing with LEGOLAND and all theme parks really. If you go on a bank holiday/during school holidays obviously it's going to be busy. No point moaning about it! Recently came back from Legoland. It was busy on monday (bank holiday) and surprisingly busy on Tuesday too. Long waiting ques, Q Bot for an additional cost and lets you reserve the ride but only once the ride waiting time is up. Overall lot of walk and few rides. We waited 45 minutes and ride time was less than 3 minutes. Dont think I'll be going back to Legoland again. This is cheaper than buying tickets direct! Any advice on the Q Bot please? I am not visiting Legoland until they put some sort of cap on number of people allowed to start with. It's like herds are allowed to wonder as they like. Not surprise, why would they offer second day free /discounts, because management is aware that family of four would not have chance to get on all rides at least once in one day, looking at number of people allowed to graze in. As mentioned on this forum and on previous thread, it's a queue land. I got two boys 7 &amp; 4 and it's very difficult to keep them entertained for an hour while waiting for their turn to get on five minutes ride. I can go on for another half an hour but rather not waste my time. I will take my kids somewhere else and there are lots of places, where they can have decent day out for the money I pay for Legoland and top of that a lifetime memories of crying children while waiting on queue. NEVER AGAIN….. Yes, without qbot and with two little ones. We were really surprised. It was really quiet on the Friday, busier on the Saturday but still easily manageable and we did the more popular rides on the Friday. Both days we got to the car park by 9:15am and left the park around 3:30pm. Like I say, did all the rides and shows and never queued for more than 10 mins (longest was the laser ride). Overall we were really impressed with legoland. We have been to the USA theme parks lots of times and they do things so well, and we are usually pretty disappointed with UK theme parks. But, legoland seem to be having a good try at it. We did two nights at the Holiday Inn Windsor Slough bed and breakfast for two kids and two adults, with two days park entry and car parking for £220. We thought that was a pretty good deal. We went last Friday and Saturday. It was brilliant, we did all the rides with max of 10 minute queues. Get there early and its great. I agree with above... Went there few months ago and the queue were huge... Waiting for hours. I think we only covered about seven rides. Legoland keeps letting people in, I don't think they have a limit. If they had their way I think they will let the whole country in, and maybe get at least one ride, lol. My 4yo has been desperate to go for ages! Have booked for Sept, he'll burst when he finds out! £119 for 4 of us, with hotel and breakfast. Tickets online would have been £101, so 18 quid for B&amp;B is amazing! Seems like a great price have a night there and then pay the stupid money for at the lego hotel. any hotels near lego land for two adults and two children? Good deal but am tempted to book via their own site as you get 1 day + 1 free and hotel for about £40-£60 more again cheaper than the tickets themselves, heat added. Basingstoke really is quite a trek from legoland..I agree Bracknell is great base and the travelodge at Frimley is lovely. stay at Bracknell Central Travelodge - only 15 mins away, free carpark, modern build and 2 mins walk to Wetherspoons for brekkie - can get for £19 night. Good deal but Basingstoke? That's 30 miles away!